Critical Neuroscience: A Handbook of the Social and Cultural Contexts of Neuroscience brings together multi-disciplinary scholars from around the world to explore key social, historical and philosophical studies of neuroscience, and to analyze the socio-cultural implications of recent advances in the field. 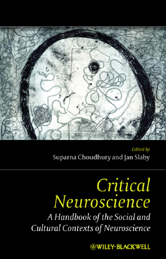 This text's original, interdisciplinary approach explores the creative potential for engaging experimental neuroscience with social studies of neuroscience while furthering the dialogue between neuroscience and the disciplines of the social sciences and humanities. How Does the Social Get Under the Skin? What Difference Can Critique Make to Neuroscience? So What should Critical Neuroscience Do? Neural Simulation or Enactive Perception? 16 Are Mental Illnesses Diseases of the Brain? 17 Are there Neural Correlates of Depression?